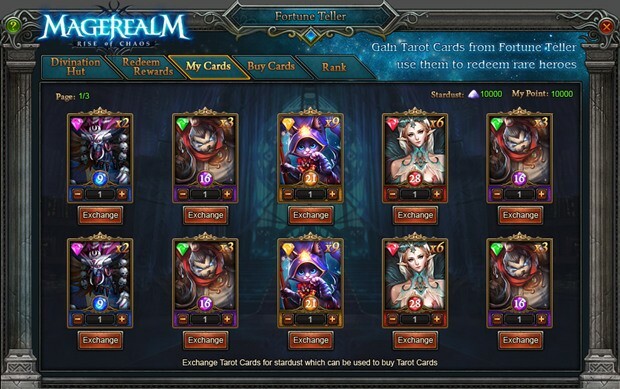 Magerealm introduces a brand new event to the game: Tarot Master! During the event, players can draw special tarot cards with the goal of collecting a tarot card set. Each completed set can be exchanged for great prizes. There will also be a ranking system for even more rewards. Tarot card sets are divided into 4 colors: Green, Blue, Purple, and Orange. Each card will have a number; the greater the number, the more rare that card is to draw. The total number of cards in each set will vary. Once a player has all the cards in a set, they can combine them to form the complete set. A completed set can be exchanged for reward items and earn points for ranking. Each card set will give different rewards, and there is a daily limit on the number of combines for each set. There are 2 player rankings for Tarot Master, one for daily participation and one for total participation. Rankings are determined by points earned during the event. Daily ranking only counts points earned that day, and resets each day. Total ranking will participation ranks overall points earned during the event. Players must earn a minimum amount of points to make the rankings. Top ranked players in daily rankings will receive rank rewards each day. Top ranked players in total rankings will receive a great reward at the end of the event. 1. Players gain points by drawing tarot cards. 2. Players gain points by turning in completed card sets. 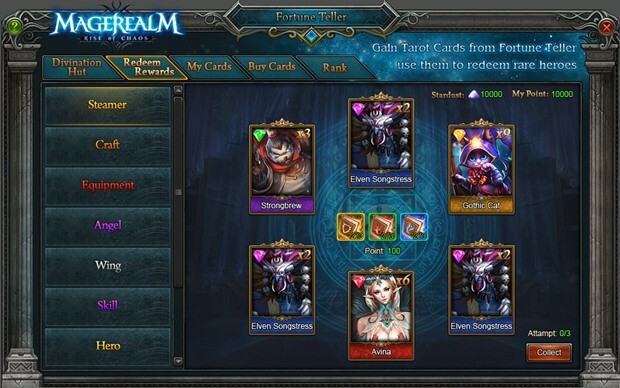 Embrace your inner collector and earn great rewards for your efforts in Magerealm’s new Tarot Master!